What Is A Personal Foot Care Nurse? Personal health care providers offer a wide range of services that address various health conditions. Problems with the feet are common issues that require specialized treatment and care. Issues such as diabetes and arthritis create health concerns related to the function and comfort of the feet. A personal foot care nurse is specially trained to provide the services you or a loved one needs for long-term health and wellbeing. Problems related to the feet are typically seen in patients suffering from diabetes. Left untreated, these issues lead to more severe complications due to nerve damage and a reduction in blood flow to the extremities. The sense of feeling can be lost, and when a patient’s foot is injured it may not be recognized immediately. If diabetes is present, an injury heals more slowly and can become prone to infection. Proper foot health care ensures that any injuries, cuts, or blisters are quickly addressed and provides greater comfort to patients. A personal foot care nurse completes the daily tasks that allow for the treatment and prevention of foot health issues related to diabetes and other diseases. They serve as a valuable resource for information that helps patients manage their own health for long-term wellness. Personal foot care nurses have the experience and training to provide the most advanced techniques in foot care. They serve as a convenient solution for your home, which allows patients to receive the best care in a comfortable and familiar setting. 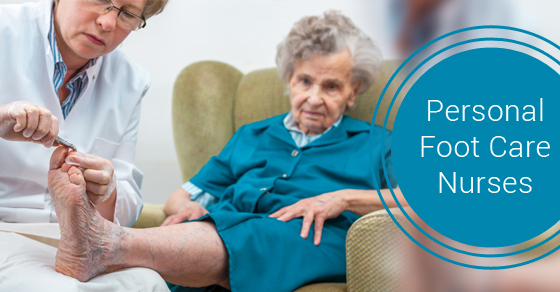 A personal foot care nurse will complete a comprehensive assessment on the patient’s health and current foot condition. They help you identify any existing problems while providing recommendations for future care. More importantly, your foot care nurse will provide you with the education you need to properly care for your feet. They care for the nails and address any callouses or corns. Ingrown toenails are also treated by your foot care nurse, helping you avoid more serious issues. If there’s a need for more specialized care, your personal foot care nurse can provide referrals to other health care professionals for further treatment. Foot care nurses assess the condition of your feet on a daily basis while checking for any inflammation, bruising, cuts, or blisters. A personal foot care nurse provides valuable services that benefit those who have foot conditions related to diabetes and other illnesses. Knowing the roles they play and the services they provide helps you find the right foot care professional for your needs. I am looking for a foot care person who can come to my home at a set time each month or two months. I am retired and need to know what the charge is for a home visit.